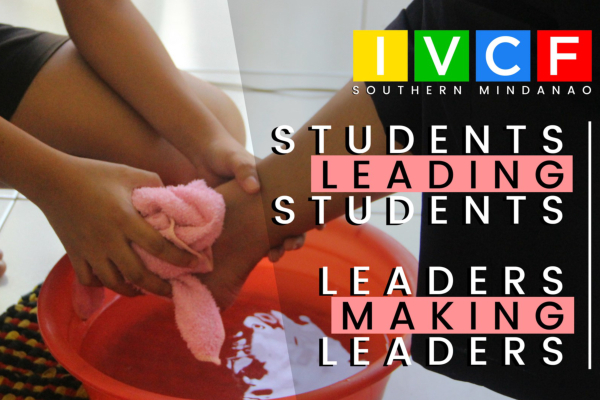 IVCF-SM as she continues to envision a steady stream of STUDENT-LEADERS for Christ within her area and beyond! IVCF Southern Mindanao has been existing for many years now. Back from her crawling years until she reached her ripe age, the region has experienced her own ups and downs, her own seasons of abundance and drought. But despite all the turbulences that went on within her, the Lord has been faithful to sustain her all throughout. Today, she is in one of those downs, one of those seasons of drought. Studentleadership is one of her distinctives as a movement. But over the past 3 school years, it is an undeniable reality that the region has reached a deeply bleak point. Such is evident in how most of the chapters have a “re-pioneering” status and in how there are only a few student-leaders left. The drained student workforce also mirrors the bare existence of the Leaders Councils in the 4 areas of the region. Her workforce, too, has not lost hope because this vision still lives within them. They are still holding on to the vision of seeing student disciples of Christ, of seeing how Christ can work in and through these students wherever He sends them. So she prays and urges others to pray with her. She prays for this vision to be preserved and passed on. She also calls for more people to share in this vision and join in her mission. All for the glory of their Master and with the assurance of their Lord’s presence, IVCF Southern Mindanao together with her workers, graduate volunteers, and all her ministry partners, will keep going on, by His strength and grace, in raising new student-leaders for Christ who will make an impact in the campuses, homes, churches, and communities. Struggling she may be, but faithfulness she still pursues. This kingdom-building vision she still pursues. She will be empowered even in the driest of the drought. And maybe these are the not-so-glorious moments of her years but she will still find herself in her unique call to stay faithful and relevant in the students’ realm. Indeed, despite the drought, the vision still lives! (‘ANIKA’ is a graduate from Ateneo de Davao University. She was a former officer of the Davao City Leaders Council. She now serves as a graduate volunteer in Davao City area. This entry was posted in Newsbits and tagged SMRU.